Currencies Accepted: During crowdsales, pledgers will be able to use any currency that is available on OpenLedger to participate. All ICOs will list prices in Bitcoin, and any other currencies used will be liquidated to Bitcoin to prevent value loss over the course of the crowdsale. CCEDK ICO Handling Fee: CCEDK will charge %1 on ICO sales. Ratio of ICO sales through CCEDK will be 1.01:1 (OpenLedger token vs. external token). CCEDK Pre-Launch Token Commission: Pre-launch ICO tokens that are being sold through CCEDK but not hosted by OpenLedger will have 5% commission go toward CCEDK team for their work associated with implementing the ICO token to OpenLedger. Ratio of pre-launch sales through CCEDK will be 1.05: (OpenLedger token vs. Pre-launch token) CCEDK reserves the right to temporarily reduce pre-launch trading fees at any time. OpenLedger Commission: OpenLedger trading commission will be %0.1. The ratio of OpenLedger tokens trading to the external token will be 1:1. Here are some answers, because we've got many questions about ICOO. The funds from the ICOO crowdsale are generally being used to help develop and support the various ecosystems working on OpenLedger all of them profiting from eacother and this way allowing the ICOO asset to be backed not only by crypto itself like the DGD gold token but also by people. These ecosystems in their various forms and activities will allow the ICOO asset to hopefully grow in value in connection with an increased amount of awareness, whether it is from the ecosystems of OBITS or BTSR or from the people connected with the conglomerate itself like CCEDK/Openledger. 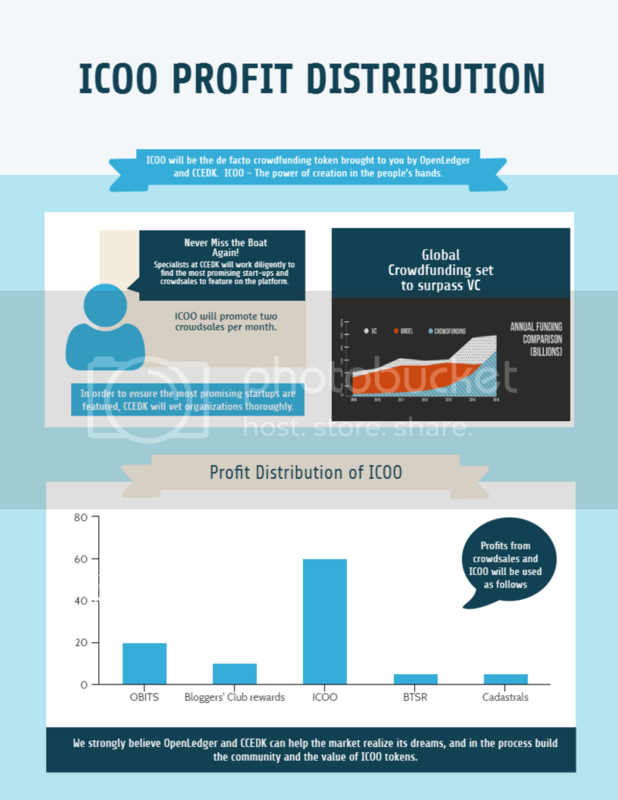 ICOO backed by advertising (This amount of BTSR is sent to a special account reserved for the future "Ambassadors" of BitTeaser network to be used as rewards for the various marketing contributions they may do promoting not only ICOO itself but all future ICO projects where a revenue stream is added to the ICOO profit distributuion. ICOO backed by bloggers and their advocating of the various promotions, activities and ICO's on OpenLedger and made aware by CCEDK team an their weekly mailouts with DC news. This amount of DGD is meant as a token of great potential value backing the ICOO asset, with the intention of having it listed on the ICOO as a proof of reserve. The DGD tokens allow a quarterly interest payout in the goldbacked asset DGX, and the idea is eventually to convert any future increased value of DGD into DGX and by then finally a created smartcoin backing the initial crowdfunding in full. It will allow the future holders to sell, buy, trade, short and long the future ICOO smartcoin backed by gold............. and on top reep the benefits in terms of either dividends or buyback(dividend option will be suggested to holders in near future) from the minimum 2 monthly ICO's presented on OpenLedger via the ICOO subscription. This amount is just another way of backing and supprting the ICOO asset and its minimum valu untill the smartcoin is created and on top allowing the ICOO team to buy up any prelaunch ICOO at the best rates possible ans then offer its subscribers the same rate as long as supply is available only with the added small prelaunch fee of 4% on top(4% is in this case the revenue stream of the prelaunch ICO's). Finally this last 30% of the crowdsale funds are dedicated to the ongoing development and introduction of features and options connected with ICOO as an ecosystem as well as its conglomerate OpenLedger and its constant urge to innovate and diversify adding on top of the almost indefinite opportunities of a platform like the BTS 2.0 is all about. So in short it is part of the supporting the future need of development of both ecosystem ICOO, as well as the conglomerate itself as a whole. I hope that answered your questions at least for the breakdown of the funds achived from the crowdsales, and I hope it is clear that I expect and intend to build on top of everything for constant improvements, as this is what the DC is all about. IT has an immense amount of possibilities an will never stop to develop, but will thrive on the growth of every single added value in eithe of the ecosystems whether they are the ones now or the ones aded in the near future. The DC works fom the inside out and has indefinite potential, and will be possible eventually to suffer a blow to one ecosystem and rise again from two others build from the foundation of the first if ever that should happen as well. NB! 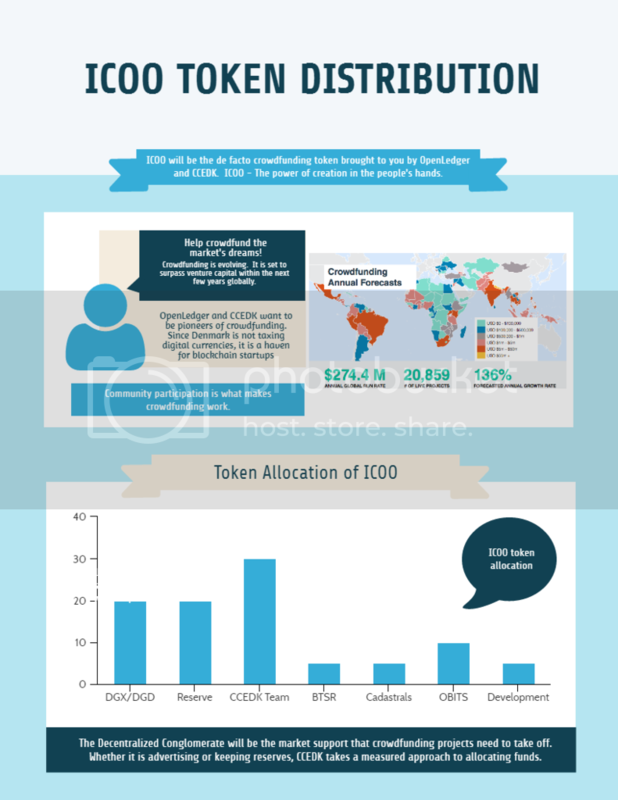 ICOO tokens will be only as many as purchased and reserved during the crowdsale and any remaining tokens of the issued 20 million will be burned at the end meaning latest July 1st 2016. Furthermore, all ICOO holders will be able to use the coming voting system added very soon to vote for future improvements or changes like for instance whether it should be buyback or dividend structure or as to when DGD should be converted into smartcoin based DGX to back a future ICOO smartcoin asset or to simply keep as a speculative investment object. CCEDK ApS and founder of OpenLedger, a decentralized conglomerate in constant development built on top of the BTS 2.0 platform with its indefinite opportunities. where is the volume on the Open Ledger exchange? how is OL going to attract volume? There are two ways to see the volume of Openledger. As the volume tend to be around 24h volume 40K per day in average at this time, where it was some 30K 1 month ago and with peaks of 150K at times of new currencies added it all looks good and promising for the future. Unlike other exchanges you are able to monitor and see all transactions real time, so there is no longer the chance of hiding pumped volume but instead it all goes as what you see is what you get, and it is really the only way forward with the idea of increased transparency in mind as well as increased security. The day you have a conglomerate full of valuable assets whether IOU's or smartcoins is the day where you have a fully decentralized economy with the people still as the center of the action. And I do see bitcoin and Eth as some of the needed sidechains for it all to be complete. OpenLedger is still in its very early stages with lots of added frontend design features in coming month as well as lots of aded code like voting an dividend system, bonds market, prediction market in full, a DGX smartcoin demurrage option added as well as sidechains or similar as a must in future added functionality and as a part of the ongoing development. Tier 2 will then take off with 925 tokens per every 1 BTC. This means that all holders who have already purchased the ICOO tokens as well as anyone ordering from now on will be able to sell, buy, and trade the ICOO on OpenLedger in the market they prefer. It is an increasing demand from holders to benefit from the speculative aspect with the added comments that it seems not right to launch an ICO of a token with the special focus of offering all major ICO’ prelaunch if the token itself is also not allowing such opportunity. We act on this right away. 2) The need to have complete promotional and professional services for issuers who want the marketing infrastructure to launch their project. The profit distribution of the ICOO is based on the revenue streams attached to the fees obtained from any of the above 2 mentioned main services. You can read more about this on www.icoo.io. • ICOO will be your ticket to all the most promising ICOs all in one place. • With ICOO you’ll never miss the boat again. You’ll invest before an ICO begins, as CCEDK will hold investments in escrow until the ICOs officially launch. • Not only that, you’ll even be able to trade a coin before the ICO is finished. • The ability to trade a token pre-launch will add liquidity to the token, but OpenLedger’s covered bonds will prevent anyone from trading tokens below official ICO price pre-launch. • This synergy will help ICO’s get a solid foundation of capital support before being released to the market. ICOO helps establish a safety net for ICOs. • The CCEDK team of professionals will work with start-ups to get their crowdfunding campaign polished and prepped for the mainstream. • They will provide their expertise and experience to assist organizations in establishing the services and promotions needed to get a campaign off the ground. • ICOO will take profits from fees associated with selling ICO packages and invest them into commodity backed digital tokens. This way, ICOO holders will see real returns over time. Creator and founder of the decentralized conglomerate OpenLedger, the ecosystems OBITS, BTSR and now ICOO, with many more to come as each and every ecosystem added will allow not only the conglomerate to grow, but also every ecosystem as they each complement each other for increased added value. Anyone buying for the equivalent of 15 BTC will become a badgeholder with lots of added benefits like a lifetime membership of OpenLedger, early access to investment opportunities, the option to take part in the decision process of choosing the monthly prelaunch ICO's to present on OpenLedger and more. Congrats to all ICOO holders and the ones to come,as we have still a full month of June left to invite more holders. Dont forget whatever amount of the initial 20 million tokens not sold will be burned, and only remaining holdes will benefit from all future revenue streams coming from the activities supervised and arranged by OpenLedger and CCEDK. PS: do not underestimate the future value in the Bloggers' Club 500 of the ecosystem OBITS and its partners from BTSR ecosystem - the Ambassadors of the Bitteaser blockchain advertising network, they will both be making a big difference i the years to come. Although it is advised to become a Lifetime membe fo maximum use the Ambassadors dont need this to make added income. Lifetime membership (LT) allows you to sign up on the bloggersclub500 to take part in the many rewards offered for active participation in spreading the word about the decentralized conglomerate OpenLedger and its ecosystems. LT allows you to trade practically for free on OL as 80% of all spent is returned to LT account within a 90 days vesting time. It is furthermore giving you a referral link to be used in all future referrals for potential revenue from the 60% of fees spent by these same referred users. The profit distribution of the ICOO is based on the revenue streams attached to the fees obtained from any of the above 2 mentioned main services. You can read more about this on www.icoo.io as well as below giving an idea of one off many options available in future. 3. receive on OL account of ICO subscriber an OPEN.ZYX asset corresponding to the ICO token and start to trade on the market of choice from user. (on OpenLedger it is possible by all users to create their very own market or use the ones already active). 4. Open asset is initially as an IOU on OL an based on CCEDK confirming to have equivalent amount of tokens confirmed to an adress, and once ICO is launched with respective wallet, deposit and withdrawal option on OL is then enabled and all OPEN.assets are backed by the cryptocurrency. ICO subscribers pay a limited fee for this service which is deducted from the OPEN asset amount which is then funded to account. 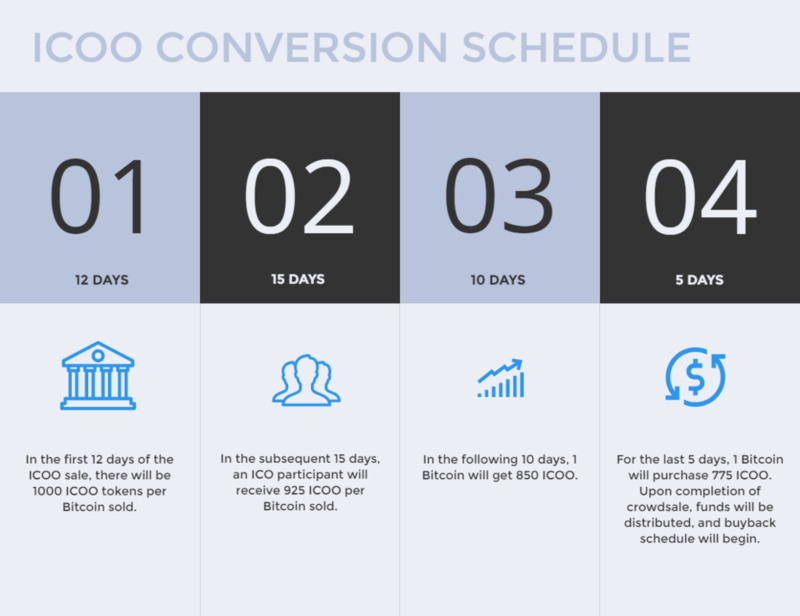 Fee schedule can be found on ICOO.io site. The option of subscribing to a certain amount of ICO tokens will be enable on the ICOO website once an ICO i announced. NB! Whether standard fee, VIP onetime amount or VIP fees achieved from this service they will be added in full (100%) to the monthly ICOO profit distribution. When speaking ICO packages or any other services for that matter on CCEDK in future, you order the content you like on CCEDK website in USD and in whichever way may fit your needs best possible and then pay for this in ICOO asset when checking out, by sending equivalent value to the CCEDK designated account on OpenLedger. a. Escrow service during ICO – 0,5% of total amount achieved and minimum 3.000 USD. a) Added to OpenLedger platform – fully integrated at launch time. b) Prelaunch ICO of same with buywall to insure no dumping below ICO price. Included prelaunch service. e. 5 Tweets a day for 1 month with up to 100 different messages in random presentation incl. all articles produced in this start-up ICO package, and same articles presented in all major forums worldwide, weekly throughout the time of ICO although maximum one month unless otherwise agreed. Above mentioned is the suggestion of a special ICO start-up package and the price would be converted into the going rate of the asset ICOO on the day of order and payment. We do not disclose the prices here, they are however possible to receive by contacting me personally at ronny@ccedk.com, or you may also wait for the CCEDK website relaunch where you will have many options to choose from as well as less intense marketing or increased. It will all be there. It is possible to pay with the ICO tokens in question as well, however with a deduction of 5% of initial ICO rate. a. It is possible to order a branding video as well, it is however quite spicy in price. Ask in case of interest. a. Issuing your own asset I possible where funds are sent to account of founder. Ask for details. Ronny, sent you a PM. As we are moving into the last 24 hours of the 2nd tier(you may see the exact time left on the countdown page on www.icoo.io) we are expecting to anounce a special ICO prelaunch as part of tier 3 to show the real meaning of ICOO presenting a usecase to underline the importance of this concept. The profit distribution of the ICOO is based on the revenue streams attached to the fees obtained from any of the above 2 mentioned main services. You can read more about this on www.icoo.io as well as below giving an idea of one of many options available in future. CCEDK has agreed with the developers of this coming ICO, a 3% fee on ICO funds brought in through the ICOO subscription and any other channels available and any profits after CCEDK costs have been deducted will be distributed to ICOO accordingly. 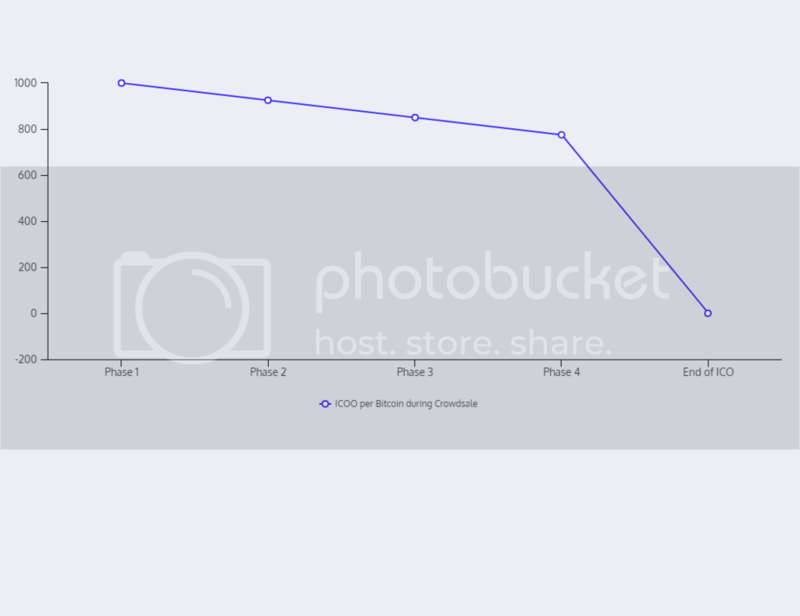 Since all specific ICOO packages on CCEDK site will be immediately converted into ICOO assets purchased via the Openledger markets and then distributed at the end of month according to schedule, the overall amount of ICOO assets will be gradually reduced due to the monthly burn of assets in connection with buyback. NB! If ever there are no more assets available on the market due to it being sold out and burned, a new ICO on the ICOO asset will be announced and a new amount of assets issued. Why should anyone wish to buy the ICO token via ICOO site rather than buying directly from ICO site? 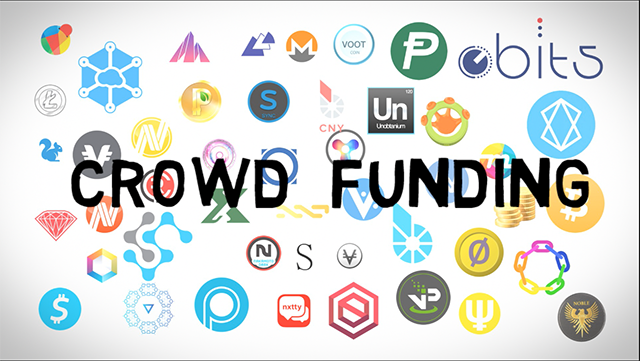 1. believing in the business of crowdfunding and the service thereof and sees the potential in holding tokens providing this. 3. interested in spending their DAO, DigixDAO gold token, MakerDAO or plain BTC directly into another startup and crowdsale. First usecase of ICOO is coming up in next few days. The lead developer of the ICO says as follows: GEN3 crypto platform, the first of its kind, where decentralized services are conglomerated to a delegated set of authorized central operators, with the addition of second tier reward based verification nodes at home users. This will enable direct blockchain throughput of 100 to 1000 txp initially. With the external blockchain storage and data optimization routines this can eventually be scaled up to 10k-50k txp boost rates to challenge VISA and any domestic web banking settlements. - major licensed corporate partners in crowdfunding, fiat currency token transfer and BTC exchange areas. I understand most of this needs clarification and white papers are soon forthcoming. Tier 2 has come to an end with a total reach so far of some 330 BTC. Tier 3 is extended and with it the ICOO to now include July as well. 3. It will allow CCEDK and its Start-Up campaign kit and other services to be fully presented and absorbed throughout the month of July as it plays an important part of the value propostion of the ICO OpenLedger (ICOO). 5. With the extension it will allow some bitcoin investors to still manage to buy into ICOO although at a slightly higher price. All Start up packages on CCEDK in future bought as ICO or ICO prelaunch packages will be considered in this same way. allowing this extra bonus to be used increasing the monthly burns of tokens. Throughout the time of the ICO of ICOO there will always be an exit with a buywall in BTC placed at the same rate of tier 1. This will be the same way in the future ICO prelaunches to insure there is no speculation in selling below the lowest ICO price. With the intent of providing a valuable service not available anywhere the ICO OpenLedger (ICOO) has been created to satisfy two specific needs. 1. The need to trade immediately every interesting and promising new coin, even in the prelaunch phase. 2. The need to have a complete promotional and professional service for issuers who wish to have such marketing infrastructure to launch their project. OpenLedger-based services will enable entrepreneurs to access the funds and skills they need for success. The Decentralised Conglomerate and the network of services comprising the ICOO asset will shortly prove their worth by kickstarting their first project: a new third-generation blockchain platform called HEAT. Any project needs funding and marketing, but this can be hard to access for decentralised projects such as blockchain enterprises. This is where a new kind of business entity comes in. The Decentralised Conglomerate is a series of linked services and assets, hosted on OpenLedger. These include advertising network BitTeaser; the OBITS bloggers club, which provides articles and other content on forums and websites around the world; CCEDK, OpenLedger’s Danish registrar, which acts as the platform’s fiat gateway and will provide further services such as escrow; and the ICOO asset, which was created both to kickstart new crowdfunded ventures and to profit from them. People who have subscribed to any of the sites www.ICOO.io, www.OBITS.io, www.BTSR.io or have ordered from there, www.OpenLedger.info as well as www.CCEDK.com data base have all received a special mailout inviting to take part pre ICO to avoid the ICOO subscription fees. Whether you wish to subscribe to the HEAT ICO or any other in future, it is possible at all times to send your funds to the OpenLedger/CCEDK offical ICO subscribe escrow account with the ICO you wish to join mentioned in memo. IMPORTANT: name of ICO in memo. When ICO has started, OPEN asset of the ICO in question will be sent to the subscribers having sent fudns, respectively. For every ICO prelaunch on OpenLedger or any ICO presented on OpenLedger there will be an escrow acccount connected to this ICO, and same account will be acting as marketmaker with funds supported by ICOO itself.